A cervical epidural injection is performed to relieve neck, upper back, and arm pain. Your cervical spine begins below the base of the skull. 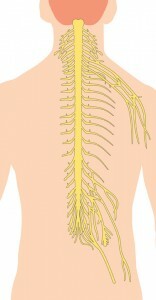 It is made up of 7 vertebral bodies, discs, ligaments, the spinal cord, and 8 pair of spinal nerve roots. From your physical and neurological examination and diagnostic imaging studies, your doctor knows where a cervical nerve root is compressed. Compression causes inflammation, which in turn causes pain. Your doctor reviews all the medications, vitamins and herbal supplements you take. Certain drugs (e.g., blood thinners), such as NSAIDS (non-steroidal anti-inflammatory drugs) and supplements should be stopped several days before your procedure. If you are taking an anti-inflammatory medication, your doctor may ask you to stop taking the NSAID, so he can accurately assess the effectiveness of the epidural injection and reduce the risk of bleeding. All medical procedures are inherent for risk. Rare but serious complications include bleeding, infection, nerve injury, headache, and allergic reaction to medication. Other risks include increased pain, injection site tenderness, and steroid side effects. Your doctor thoroughly discusses your personal risks before the procedure. A cervical epidural injection procedure is performed in a sterile setting, such as an operating room or ambulatory surgery center suite. You change into a gown. An intravenous line is started, and medication is administered through the IV to keep you comfortable. You may be awake or in a twilight state. In the surgical suite, you are positioned to give the doctor good access to the back of your neck. The skin area is cleansed using a sterile soap. A local anesthetic is injected to numb the area. A special imaging machine called a C-arm (fluoroscopy) is positioned to enable your doctor to view the cervical spine during the procedure. A small amount of contrast (dye) is injected to confirm needle placement. Next, the corticosteroid medicine is injected into the epidural space (inside the spinal canal). A corticosteroid is a slow-releasing and long-lasting anti-inflammatory medication that effectively reduces inflammation. Sometimes your doctor includes a narcotic in the injection to maximize pain relief. As the medication is injected, it flows around and coats local nerve roots. The procedure takes about 15 minutes but may take longer if more than one injection is performed. A small bandage covers the entry point of the needle. You are moved into a recovery area and closely monitored before being discharged home with written aftercare instructions. We call you the day after your procedure to follow up. You may experience some discomfort for a few days after the procedure. This is normal. It does not always mean the corticosteroid is not taking effect. We ask you to record your pain levels and other symptoms after the procedure. Your pain diary helps your doctor to fine-tune your treatment plan.